The U.S. objection to withdrawing People's Protection Units (YPG) from Syria's Manbij may not be President Donald Trump's own will, President Recep Tayyip Erdoğan said Monday. His statement came during a news conference held ahead of his visit to the Bulgarian city of Varna to attend the EU-Turkey summit. Erdoğan affirmed the reports that PKK terrorists were withdrawing from the Sinjar district and Iraqi troops were being deployed to the region, saying that the Iraqi army did intervene against the terrorists. He also announced the impending arrival of an Iraqi official to Turkey in order to provide information regarding latest developments. 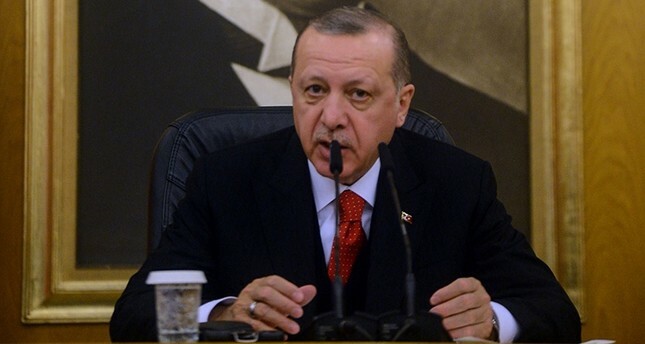 Answering a question on reports suggesting that the terrorist group will remain in the area under a different name, Erdoğan said that Turkey is ready to do whatever is necessary in Sinjar if the Iraqi operation fails. He added that National Intelligence Organization (MİT) Undersecretary Hakan Fidan will meet an Iraqi official today regarding a potential operation in the area, along with the current situation. The PKK first established a foothold in Sinjar in 2014 on the pretext that it was "protecting" the local Yazidi community from the Daesh terrorist group. Erdoğan also recently hinted at the possibility of a military campaign aimed at dislodging the PKK from Sinjar.